Approximately 61 years after the first revolution in 1952 when a military coup d’etat led by Gamal Abdel Nasser and a group of army officers of the Free Officers Movement overthrew King Farouk, the military once again has had a role to play in ousting a leader. This time however, their role is limited to facilitation of transition and not gripping on power and these intentions were clearly stated. A democratically elected president, Egypt’s first, was overthrown without much bloodshed and by the will of the people in a coup that was not really a coup. The army was not acting on interior motives but on behalf of the people. Despite this, it seems too good to be true- Egypt has a long road to recovery- not just from the scraps of the year-long Brotherhood rule, but from 30 years of decline. One moment I was tense about what would unfold after the military issued 48-hour ultimatum would come to an end and the next moment I find myself absorbing the words being spoken by General Abdel Fattah al-Sisi, the defence minister. Yes, he had just fired Morsy from his job and somehow I still couldn’t believe what had just happened. Then there were fireworks and rejoicing. 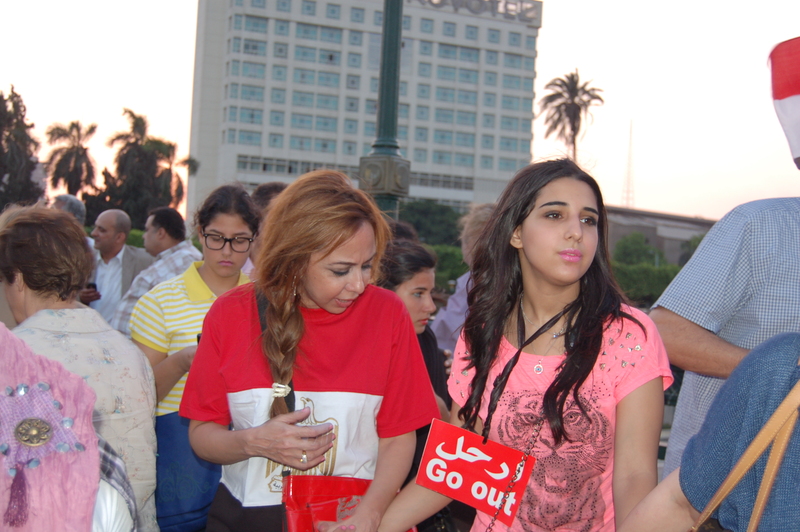 I was in a middle of a Farsi lesson, but my student and I could not resist our temptation and made our way to Tahrir. 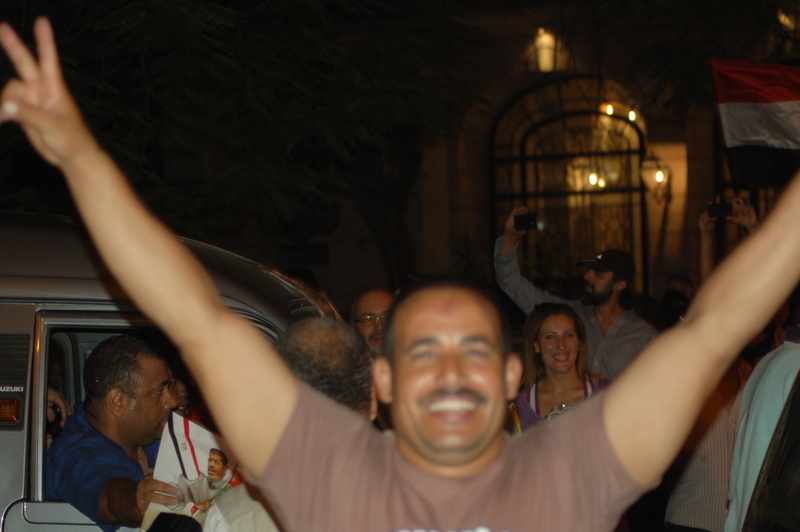 On the way we were met with celebrations by very happy Egyptians. There was immense joy in their cheers for people could be seen sitting over cars and popping out of the windows of their vehicles and everywhere imaginable with the Egyptian flag soaring high. They were truly happy, truly relieved. 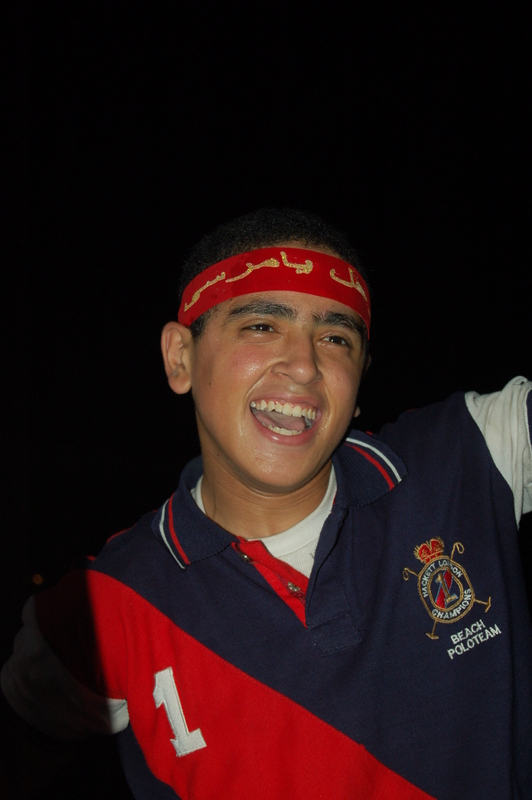 I joined in and jumped out of the taxi with the Egyptian flag in one hand and my Nikon in the other. One girl didn’t want any trace of Morsy as she tore to bits posters that contained his picture and that read “Arhal- Leave”. I was living through a chapter our children will read in their history textbooks. But for Egyptians it is more than symbolic. Their president had just been ousted in what had been a mostly peaceful process. 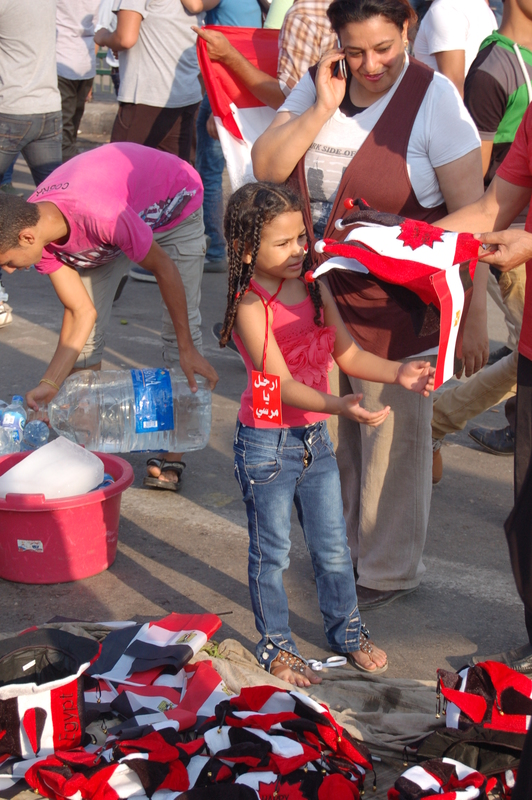 In Tahrir, fireworks and the loud sounds of whistles and cheers, flags being raised high, painted faces, clothing and hats that matched the Egyptian flag and sheer happiness. I was part of something similar a year ago when I had joined the Pro-Morsy group in their celebration when he was announced Egypt’s first democratically elected leader, and yesterday, ironically I was waving my Egyptian flag high in another celebration of the same leader being ousted! It felt great, but not because I agree to the way things unfolded since the 30th but because the voice of the “majority” of Egyptians was heard as one voice- poor, rich, upper and working class- were all at the square standing shoulder to shoulder. Celebrations aside, a myriad of questions and challenges now need to be addressed. 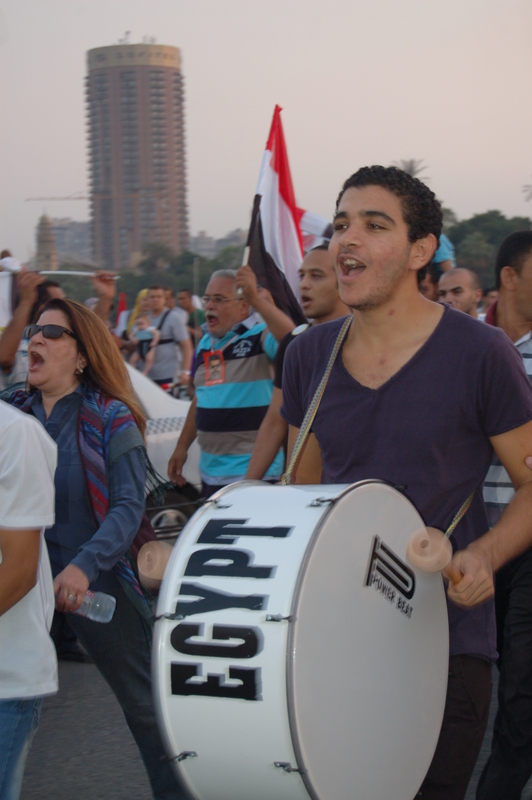 Most important of these is what happens to the pro-Morsy camp? They have been ignored in this equation of the Egyptian people. While comparatively their voice is much lower than the opposition, the opposition should not repeat the mistake made by their ousted leader. Isolating any group could lead to a repolarization. And mistakes at this point are best kept for another time. For instance, shutting down news agencies run by the Muslim Brotherhood and Islamists is media censorship and an infringement of the freedom of press just as it would be if the liberal and independent news stations were taken off air. So why this distinction? 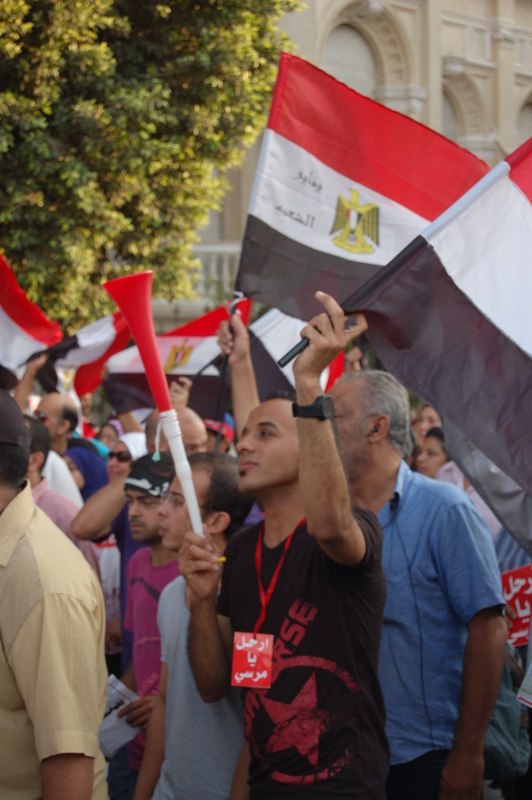 Some Egyptians are of the opinion that the Ikhwan were inciting violence via the news channels. The Committee to Protect Journalists should speak out as they always do when some anti-government journalists around the world are detained or oppressed. The road plan should focus on uniting camps and not on isolation. Similarly arresting Brotherhood members and putting the ousted President under house arrest is counterproductive considering that they haven’t committed any heinous crimes. Morsy just failed to bring changes to the country. Did he kill or order the killing of anyone? No, except his last speech in response to the protests against him could be implied as inciting plans for civil war. So the opposition and the military seem to be isolating a smaller yet substantial population. Democracy would only be successful and sustainable if the minority are able to co-exist peacefully with the majority. A second but equally important challenge is to restore security, which would have a domino effect on the tourism sector. Tourists should be assured that they will not be caught up in the midst of a civil war or the likes of it. Tourism employs at least 12% of Egypt’s economy and the sector has been in shambles, struggling to survive in the badly hit economy since early 2011. The challenge would be to restore faith in the security forces via media which has also been the channel for provoking worry for the many that were looking at the land of the Pharaohs as their travel destination. A tourism campaign like India’s “Incredible India” and Malaysia’s “Malaysia- truly Asia” should be launched once the situation is calm. Also licensing of the numerous informal tourism agencies should be undertaken and the bureaucratic and expensive process should be done away with in order to encourage these agencies to formalize. This step would be productive for both the companies and the government. Sexual harassment, which is a nightmare situation for most women including foreigners, should be dealt with an iron fist. Nothing short of severe penalties should be issued to the offenders. Men should know that it is not ok to touch a woman inappropriately even if she is not conservatively dressed. What is surprising though is that the foreigners who either work or study in Egypt dress more conservatively than most modern and affluent Egyptian women and yet they are subjected to harassment. Many will be seen with a stole or scarf wrapped around their chests. This speaks of the deep underpinning problem, which is the educational system, which has long influenced the culture of harassment. In a conservative culture, where men would kill to protect the honor of their sisters, mothers and wives, one must ask what makes it acceptable to them to harass other women, particularly foreigners? And what is it that they expect when they do abuse a woman either verbally or physically? There are a few civilian initiatives like Harassmap that have joined hands to tackle this issue, but they mostly cater to women. The men, who are the instigators of the violence, are left out of the equation. While it is important to educate women on their rights and teach them how to protect themselves. It is vitally important to teach men why and how to not act inappropriately. The government should play a proactive role and could perhaps begin by incorporating anti- harassment education in schools and other education institutions. Community workshops and events are just two of the many ways of bringing this issue to the forefront and ensuring that men in every corner of the country including rural areas realize the effects of their action. Mobilizing men to do spread the message is effective. In the meanwhile, anti-Ikhwanis – are back in their homes and are going about their daily business and waiting for the plans for the election and their constitution to be announced. The ousted regime joins the ranks of Mubarak, and so suddenly. But why wasn’t Mohamed Morsy given a full term to prove himself as a faithful guardian of the country? No one, including his close contender in the last election could solve all of Egypt’s problems. His mistake was that he had focused far too much on empowering members of the Brotherhood. One year, echo many Egyptians had caused enough rifts within the country and he was on the path to take the country back a hundred years! Isn’t this enough ground for an ouster? 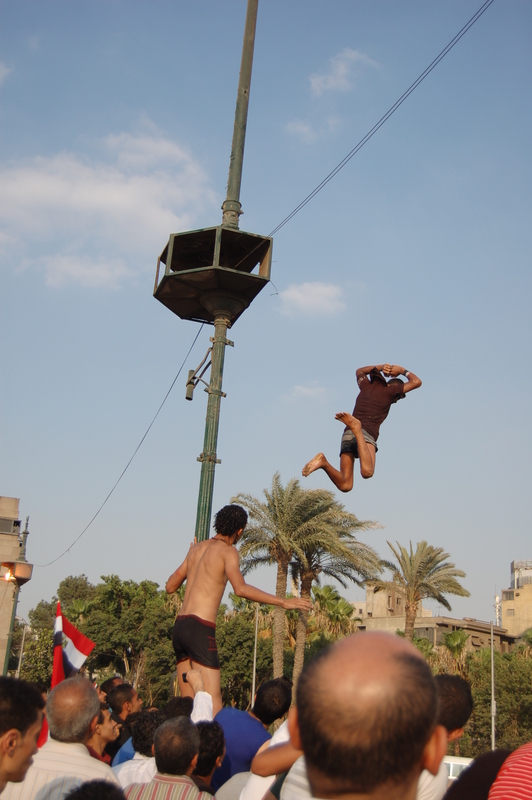 Egyptians jumping into the Nile as a symbolic way of showing their anger at Morsy. 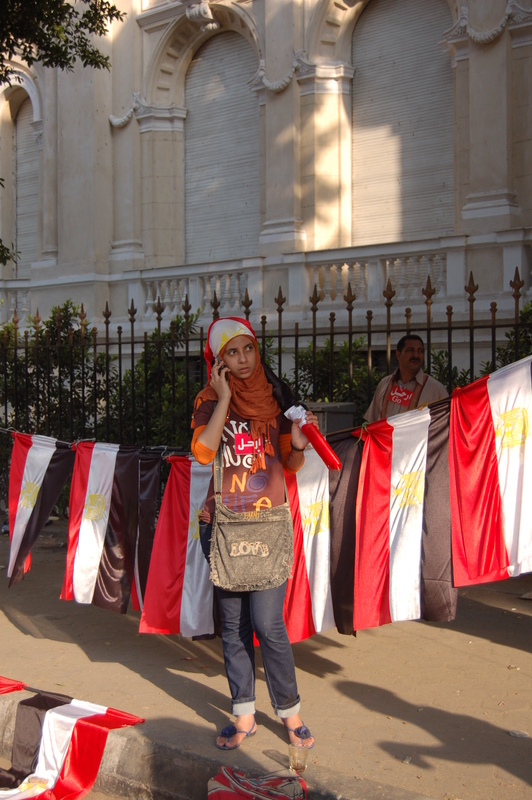 This is a nice piece of literature offering a foreigner’s account of recent events in Egypt. It goes to show just how confused and fundamentally screwed Egyptians are. The article also outlines the country’s fundamental problems or challenges which they are already facing. It is a sad and deteriorating situation. People were celebrating as if change was going to happen tomorrow; instead all hell has broken loose. Plenty of hopeless shabaabs (who are bored and aren’t doing anything with their lives), thugs and religious nuts are riding the storm, destabilizing the new ‘regime’. The army has done a pretty poor job regarding the security situation. There is very little hope that the country can head towards the right direction. Meanwhile, El-Baradei is set to be Egypt’s new Prime Minister which is a vaguely positive step for Egypt. In my opinion, El-Baradei is a coward and should have took the reigns long ago and even so, he hasn’t really proven himself either. Egypt is HOPELESS and will continue to deteriorate; it always have been. Egyptians will never learn from their mistakes and will never solve their fundamental problems. The police should be the government; however from what we have seen, they are completely useless. They sit around and do nothing when violence kicks off around them. The army is a complete joke. Military receives plenty of training and funding, yet they can barely protect themselves; for example, getting kidnapped by Bedouins who are fair more inferior to them. They are using live ammunition and killing normal Muslims now. Do they even know what and why they are doing this? Responsibility relies on people and it’s just too bad that Egyptians are blinded by mosques and conspiracies throughout history. There has always been tension between Egyptians, simply due to the lack of education. The poor are illiterate and the only education they are getting, is through local mosques. They are obviously going to align themselves with whatever their party decides. The problem of education will never be solved because religion is so deeply entrenched in Egyptian society, especially rurally. There is no legitimacy in this country. The country is still dealing with British imperialism because that is the last real power before 1952. People talk about revolution or coup, it is all meaningless politically and culturally because the military has just been switching sides, from leaders to leaders. The real revolution should be against the military. Nothing has changed, the Egyptians (anti-Morsi) have fallen back to the army because it’s ‘better the devil you know’.